Joel Edgerton is someone in the film world to pay attention to. The Australian is well known to Americans for his acting in Loving, The Great Gatsby, and Black Mass, and as well for his writing/directing/producing talent in The Gift. 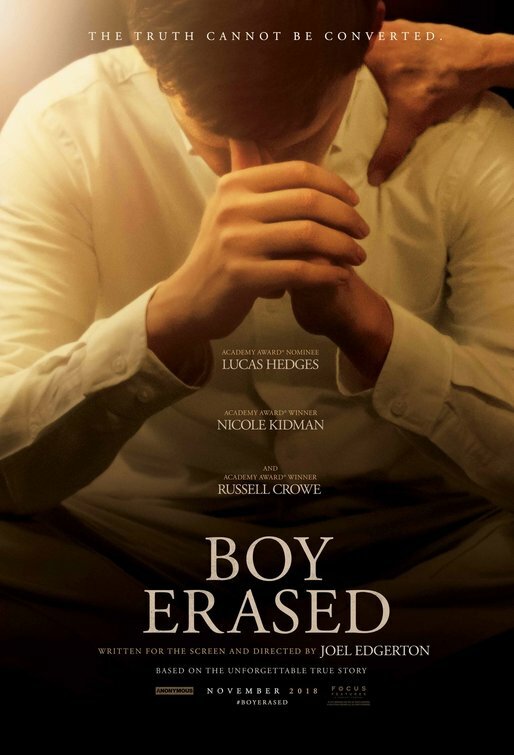 Now, he comes out with an award-worthy production informing us about conversion therapy, based on a memoir by Garrard Conley about his real-life experience. Edgerton impresses us with his talent for telling a story with elements of experience and perspective from multiple points of view. By the end of this movie, we have a real sense of the individual, family, religious community, and programmatic aims and aspirations of the participants. Lucas Hedges as Jared Eamons lives up to his promise as an actor who can play complex characters with subtlety and poignancy. Here, he is a budding college student who is curious about the world, is compassionate and sincere, loves his parents, and wants to please them. You see him naively trying to follow the script written for him in love, marriage, and career, primarily by his father, a pastor, and secondarily by his mother who goes along with her husband most of the time. The beauty of the film is in its focus on Jared’s discoveries and transitions he must make on his own journey. Nicole Kidman and Russell Crowe as Jared’s parents exquisitely capture the essence of shock and anguish so many sincere, loving families undergo when they’re not prepared for the news and have been taught that homosexuality is vile and a sin. These parents, like so many others, are not prepared for the paradox they must face: the child they know and love does not sync with their fundamental beliefs of what is good and honorable. Of course, Edgerton nails Victor Sykes, the head of the conversion program—part suave salesman, part corporate chief, and part pseudo-therapist—primarily interested in his investment. He gives out clues about himself that are born out over time, another example of Edgerton’s skill. Music by the team Danny Bansi and Saunder Jurriaans plays a significant role in enhancing the dramatic ups and downs of this important film that is difficult to watch at times. But sticking with it pays off. A look at conversion therapy and a family’s experience of it.